Contra Costa Chess Club: CHESS at Starbucks Thursday Sept. 26 and Sunday Sept. 29 at Starbucks! CHESS at Starbucks Thursday Sept. 26 and Sunday Sept. 29 at Starbucks! We continue to have some pretty interesting chess challenges over the boards every Thursday evening and Sunday afternoon at Starbucks located at 1536 Kirker Pass Rd., Clayton, Calif. Last Thursday some 17 players came by for the fun, which featured a dessert tray being passed around towards the end of the session, and Sunday saw nearly the same number of players enjoy an afternoon of chess, highlighted by IM-elect Ron Cusi taking on speed chess challengers just for the fun of it, capped by a group going across to the Hawaiian BBQ place for a nice meal! Thursday evenings we meet from 6:15 p.m. - 9:30 p.m.
Sunday afternoons we meet from 2:00 p.m. - 6:00 p.m.
At either session, drop in anytime, the earlier the better for the best tables, more games, and really, some pretty good company! It's official! Our 5-round, USCF-rated 2nd Annual East Bay Open Chess Tournament (with 4 sections) has been scheduled for your choice of three days Dec. 6 - 8 (Friday evening thru Sunday) or two days Dec. 6 -7, 2013 (Sat. and Sun.) at the Concord Crowne Plaza. Chief TD will be Richard Koepcke, assisted by Club TDs Nenad Zagorac, Anthony Blessing, and yours truly! Click here to download the flyer for all the details and an entry form. If you need to join the USCF or renew your membership, you can do so directly on www.uschess.org, or through your local chess club. Note that players save $15 if paid entries are postmarked or otherwise given to me on or before 11/23/2013. For those staying at the hotel, book your stay by November 20 using Code EBO for the preferred rate of $84 per night. 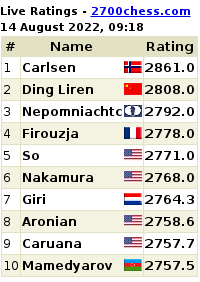 Thanks very much for your support of the grand game of Chess ! !